Born in Toronto in November 1893, William signed on in Barriefield, Ontario, in August 1915. A clerk by trade, and declaring 6 months previous military experience with the 48th Regiment, William attested into the 8th CMR on August 28th, 1915, which was absorbed by the 4th CMR in January 1916. At the time of William's loss, on March 23rd, 1916, the 4th CMR was serving in the front line near Sanctuary Wood, Ypres. They went in on March 20th, relieving the right battalion of the 72nd Brigade, and came out, with 4 men killed and 5 wounded, when they were relieved into Brigade Reserve by the 5th CMR on March 25th. It is reported that around 9am on the morning of the 23rd, William was standing outside his dugout, in trenches south east of Zillebeke, when he was hit high in the back by an enemy bullet. Pte. 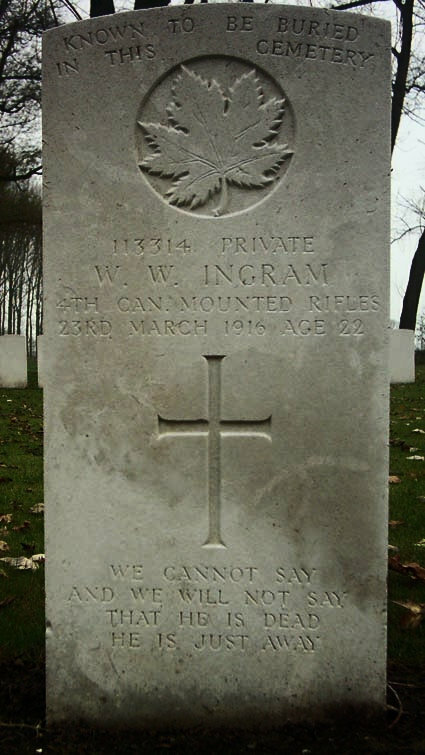 William Ingram is one of 12 men of the 4th CMR known to lie at rest in the small and peaceful Maple Copse Cemetery, near Sanctuary Wood, Ieper.